Dr.Karima has more than 90 international publications and 3 patents. She has also supervised 26 Masters of Science and PH.D theses. Furthermore Dr. Karima is decorated with a number of awards including; NRC Scientific encouraging Prize in Chemistry, Egypt in 1991,International Federation of Inventors Mediterranean competition for inventions protecting the environment. Italy in 1995, Prof.Dr.M. k. Tolba's Environmental Prize for: "The Best Applied Research to Protect Air, Water and/or Soil" (ARST )1998 and NRCScientific Appreciation Prize, Egypt 2012. In addition Dr.Karima was awarded a number of certifications including; Certificate of Appreciation from Syndicate of Chemistry for her contribution dissemination of culture and scientific information in 2007 and Certificate of scientific achievement at NRC for four consecutive years in 2009, 2010, 2011 and 2012. She acted as Principal Investigator (PI) and Co PI for the National and international research on a number of projects. She acted as a referee for international and national research papers, projects and theses.Dr.Karima organizes and conducts international training courses addition to Chairing and Co-chairing International and national Conferences & Exhibitions. She has conducted a number of presentations in the field of wet processing of textiles at the National Research Centre. 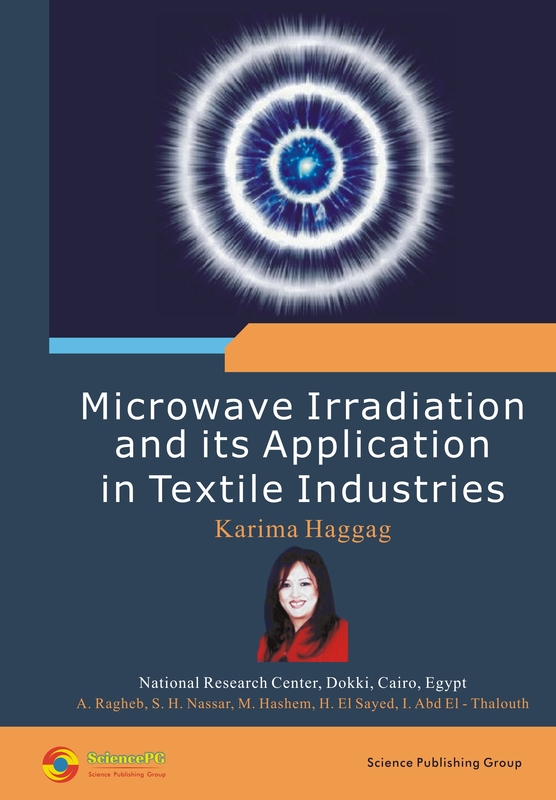 Dr. Karima’s research focuses on microwave in textile wet processes, nanotechnology in textile, improving performance properties of colored textiles, Eco-friendly dyeing and pigment printing's pollution prevention and cleaner production in textile. Textile processing consumes huge amount of energy as in dye fixation and heat setting. Heat can be transferred to material by radiation, conduction and convection. These three ways of heat transfer can be used either separately or in combination. Saving time and energy is of immediate interest to textile industry. The introduction of new techniques which will allow less energy to be used is a highly important area of activity to consider. A relatively short section of properly designed microwave heating can increase production speeds. In microwave processing, energy is supplied by an electromagnetic field directly to the material. This results in rapid heating throughout the material thickness with reduced thermal gradients. Volumetric heating can also reduce processing times and save energy. The microwave field and the dielectric response of a material govern its ability to heat with microwave energy. Knowledge of electromagnetic theory and dielectric response is essential to optimize the processing of materials through microwave heating. This review addresses major basic and practical aspects of microwave irradiation as means of heat generation. Emphasis is placed on electromagnetic field dielectric response as well as application of microwave heating to textile coloration, processing equipment, and microwave/materials interactions. A future outlook is also reported within the increasing importance of microwave irradiation in textile coloration and other domains of application. In the last three decades, the microwave oven has become an essential appliance in most kitchens. Faster cooking times and energy savings over conventional cooking methods are the primary benefits. Although the use of microwaves for cooking food is widespread, the application of this technology to the processing of materials is a relatively new development. The use of microwave energy for processing materials has the potential to offer similar advantages in reduced processing times and energy savings. In conventional thermal processing, energy is transferred to the material through convection, conduction, and radiation of heat from the surfaces of the material. In contrast, microwave energy is delivered directly to materials through molecular interaction with the electromagnetic field. In heat transfer, energy is transferred due to thermal gradients, but microwave heating is the transfer of electromagnetic energy to thermal energy and is energy conversion, rather than heat transfer. This difference in the way energy is delivered can result in many potential advantages to using microwaves for processing of materials. Because microwaves can penetrate materials and deposit energy, heat can be generated throughout the volume of the material. The transfer of energy does not rely on diffusion of heat from the surfaces, and it is possible to achieve rapid and uniform heating of thick materials. In traditional heating, the cycle time is often dominated by slow heating rates that are chosen to minimize steep thermal gradients that result in process-induced stresses. For polymers and ceramics, which are materials with low thermal conductivities, this can result in significantly reduced processing times. Thus, there often is a balance between processing time and product quality in conventional processing. As microwaves can transfer energy throughout the volume of the material, the potential exists to reduce processing time and enhance overall quality.